There are four categories for two wheels: AM, A1, A2 and A.
Learn2Ride Motorcycle Training can provide full training for your module 2 road test. Module 2 is the on-road module of your full licence and normally takes about 40 minutes. You must bring your theory test pass certificate, your CBT certificate, your module 1 pass certificate and both parts of your driving licence to the module 2 test. What happens during module 2? You’ll have to correctly read a number plate on a parked vehicle. The vehicle will be at least 20 - 20.5 metres away. If you can’t pass the eyesight test you’ll fail your test and the test won’t continue. You will be asked a number of safety questions by your examiner. Please click here on the Learn2Ride motorcycle training website for Show Me / Tell Me Questions. 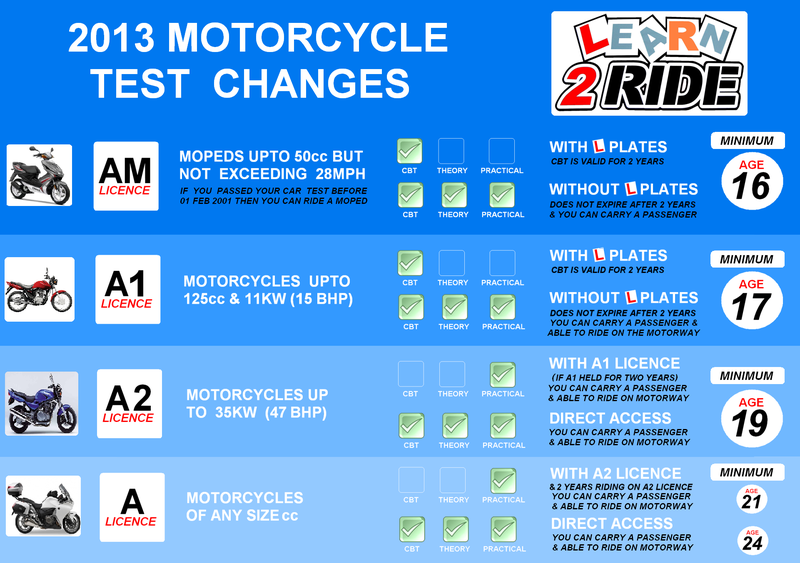 Please click here on the Learn2Ride motorcycle training website for information on Independent Riding. Why not join the many happy riders who have passed their motorcycle test with Learn2Ride motorcycle training. Just call or text 07511383541 now! You can help prepare for your road test with these books and DVDS. Please click here for Recommended Reading & Viewing.